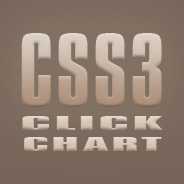 CSS3 is fun to mess around with, and this info chart has certainly kept me busy and helped me to become more familiar with the newest techniques in CSS. I’ve made updates and modifications to the click chart, including a few improvements to some of the already-existing examples to make them more specific. The changes are listed below, or you can skip the boring descriptions and just use the demo button to view the updated chart. As usual, feel free to offer any suggestions or corrections. I’ve closed the comments on this post, but you can leave comments at the original article here.